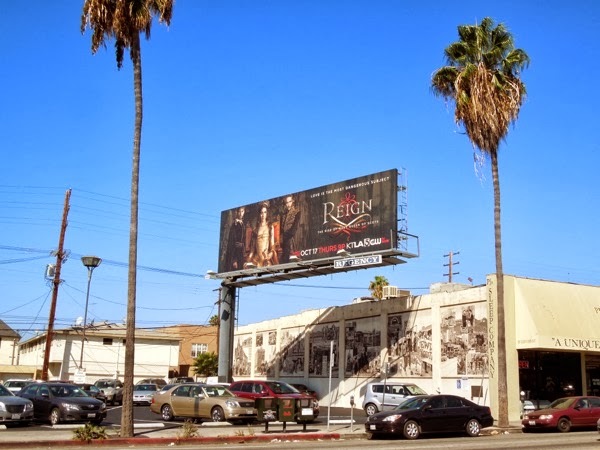 In addition to looking to the future with The Tomorrow People this fall, The CW is looking to the past to capture audiences imaginations with its new period drama, Reign, following the rise of Mary, Queen of Scots. 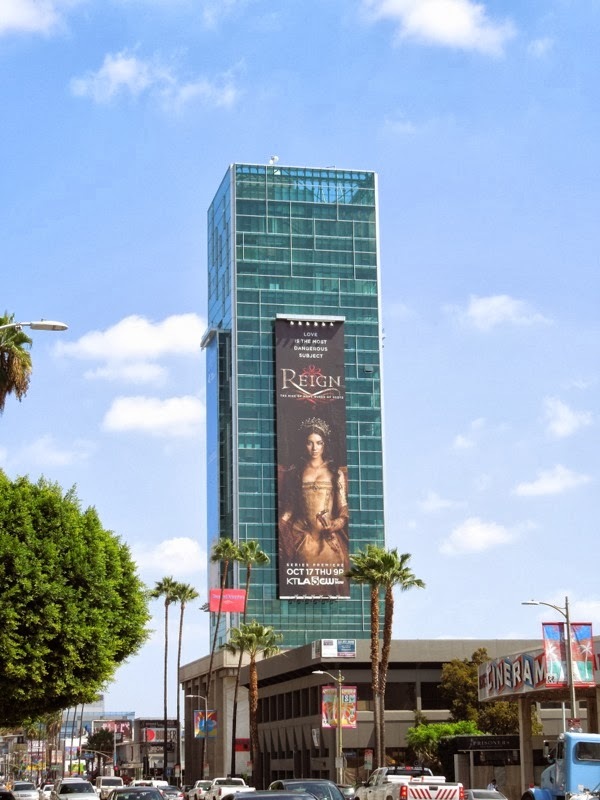 As well as lavish costumes and sets, you can probably expect some political, religious and romantic scheming to keep you hooked. 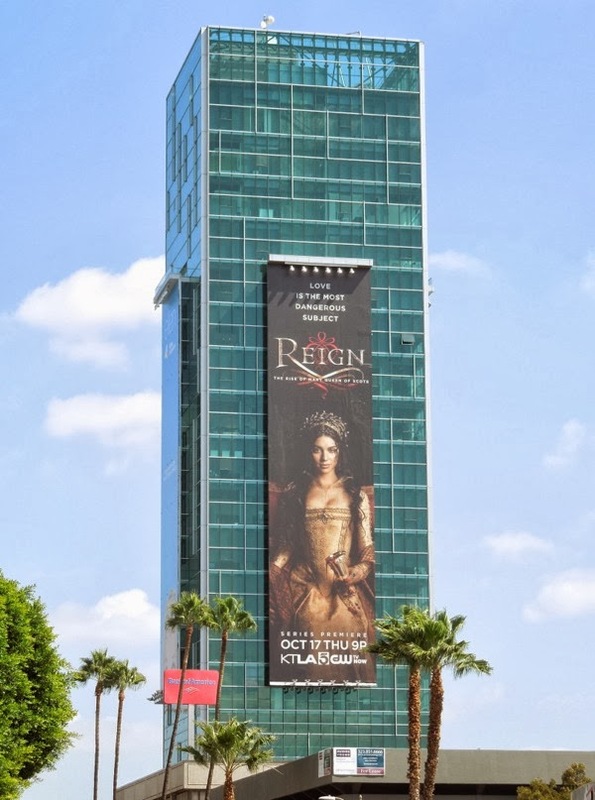 Teen Wolf's Adelaide Kane stars as the headstrong teenage monarch, as 'Mary' and her ladies-in-waiting arrive in France to secure Scotland's strategic alliance with the country by formalising her arranged engagement to the French King's dashing son, 'Prince Francis' (played by Toby Regbo). 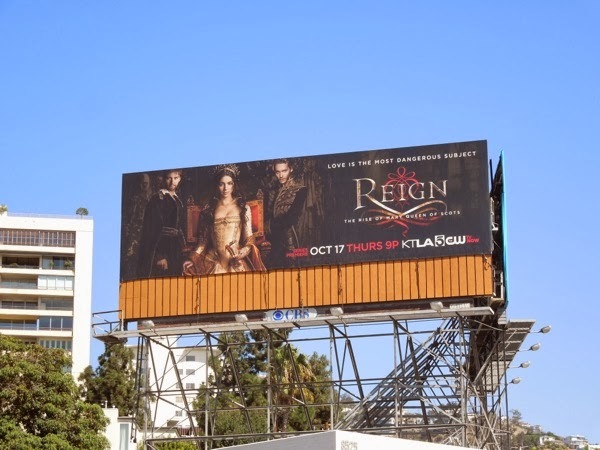 But royal marriages and affairs of the heart never run smoothly, and the fiery Scot also attracts the attention of the Prince's half-brother 'Bash' (played by Torrance Coombs). 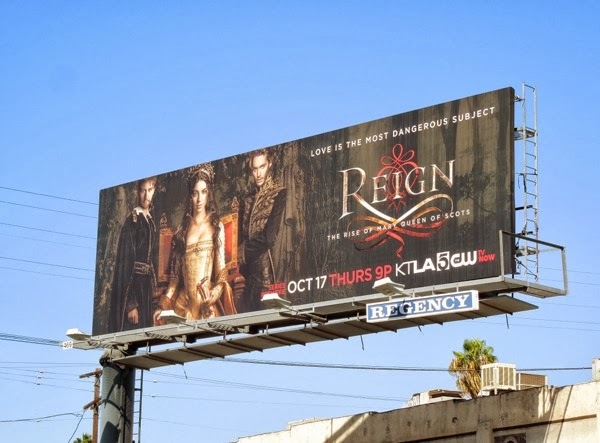 Ahh, there's nothing like a love triangle to keep viewers watching. 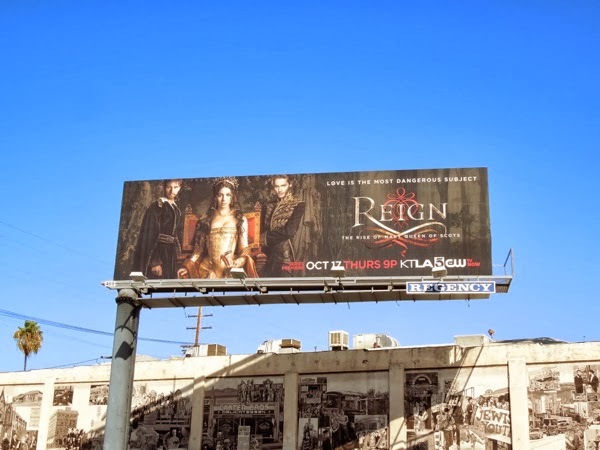 Reign sounds like a less raunchy version of Showtime's The Tudors, and after all Mary was the great-niece of King Henry VIII of England, but it looks like there'll be the same kind of intrigue and political machinations in this period drama set in the 1500's of Tudor Britain. 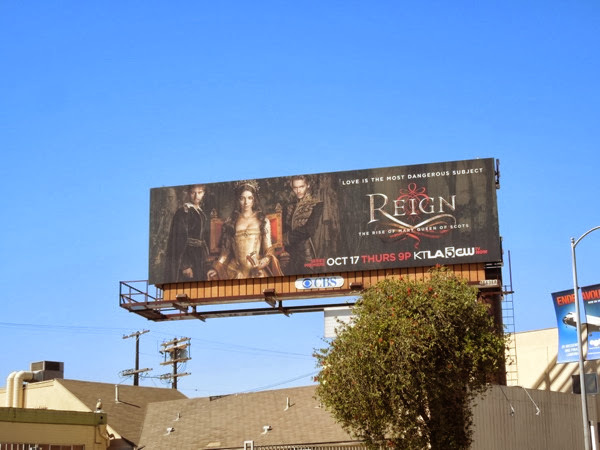 These series premiere billboards for Reign were first spied towering over Sunset & Vine in Hollywood on September 11, whilst standard landscape versions were soon snapped around the streets of L.A., including along Melrose Avenue, Santa Monica Boulevard, Fairfax Avenue and La Cienega Boulevard, appearing in the last week of September 2013. 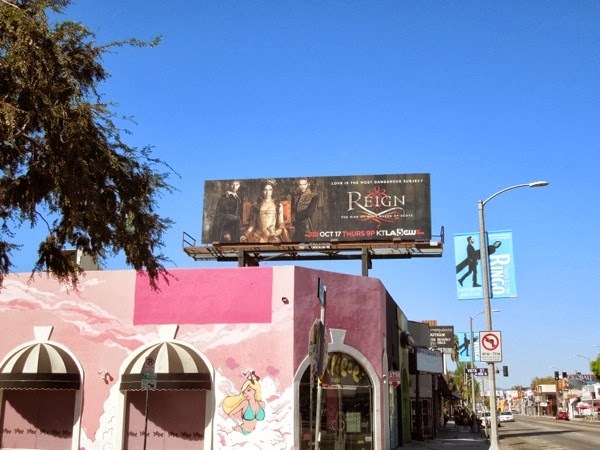 Love is often the most dangerous subject, so let's hope this historical series is as eventful as the infamous Queen's life was, but hopefully not as tragic.